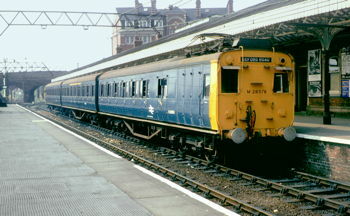 A unit in BR blue, including motor coach M28578, stands in platform 1 at Altrincham station. (a) Motor coach Weighing 57 tons and seating 72 third class passengers, with a guard's compartment (also for prams, mail, etc) and a driving compartment. 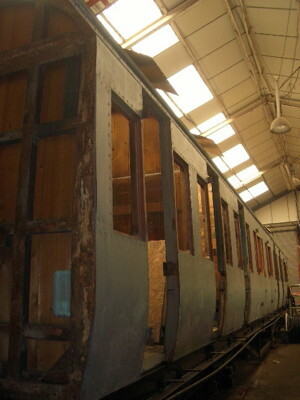 It had a pantograph on the roof and the motor bogies. 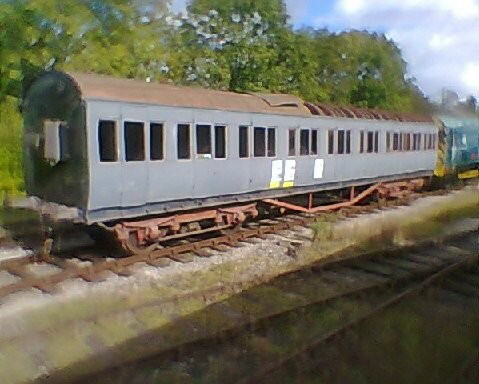 (b) Trailer Weighing 30 tons when empty, this seated 40 first class and 48 third class (later modified to 24 first-class and 72 third-class). (c) Driving Trailer Weighing 31 tons; seated 108 third class and had a driving compartment. Contained the 'ladies only' compartment. For peak time use six–coach trains were formed of two units; usually with a motor coach at each end of the train. Despite the contemporary trend to saloon style carriages, these were built compartment style for swift loading and unloading at stations. 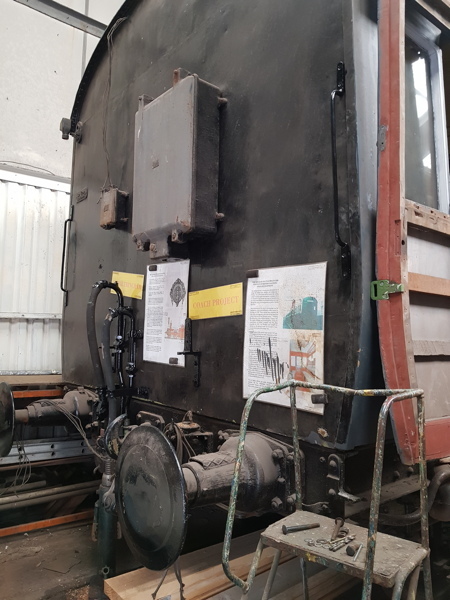 The coaches were teak framed with sheet steel panels; the roofs were entirely angled steel sections covered with sheet steel steel; the floors consisted of galvanised keystone corrugated steel covered with Induroleum (a rubber flooring material), over which brown lino was laid. The first-class compartments were finished in walnut, with blue cloth upholstery and seated eight passengers. Third class were mahogany finished, upholstered in red and black moquette with seating for twelve. In both classes of compartments the luggage racks above above the seats were of wooden frame and string netting. 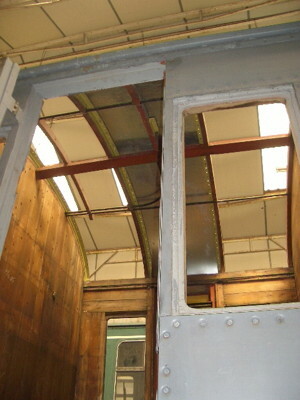 Above the compartment doors were ventilators, there were bars across the door windows and blinds were fitted to the seat windows. Match strikers were fixed to the door frames. Set into position above the seats at eye level were glass-covered pictures of beauty spots, a mirror and the MSJ&AR route map. 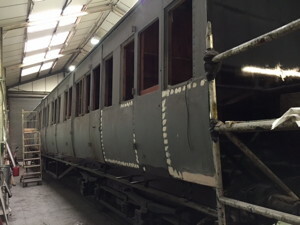 Heating and lighting were controlled from the driving compartments. The heating had three possible levels: full, half, or none. Each compartment had four 300 watt heaters (wound for 750V) with a pair in series; they worked directly off the 1500V DC supply. A motor-generator on the train, powered from the 1500 volt supply, provided 110 volts for the lighting circuits. 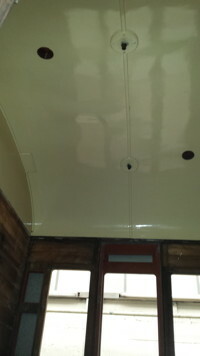 The third-class compartments had two ceiling lights wired in parallel; the first-class one had one ceiling light and four bracket lights, switched on by the passengers. This parallel wiring ensured that if one heating or lighting element failed the other one was unaffected. 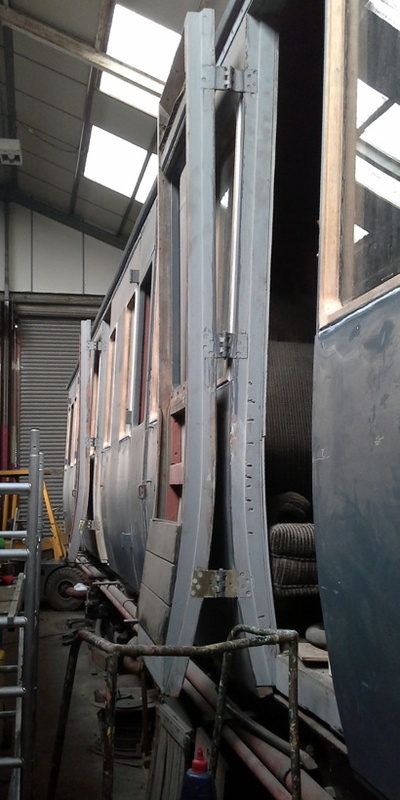 The AERPS purchased, for preservation, two air braked centre trailer coaches (MSJ&AR Nos. 117 and 121 [BR M29666M and M29670M]) a few months after their withdrawal. They were moved to the Yorkshire Dales Railway (now Embsay & Bolton Abbey Railway) at Embsay near Skipton. Their arrival enabled the line to introduce a passenger service. After several years, because they lacked vacuum braking, passenger train use of the coaches had to be discontinued. Stored in the open their condition soon began to deteriorate. In 1983 the coaches (together with the Society’s ex-Army box van) were transferred to the Midland Railway Centre (now Midland Railway-Butterley) at Butterley in Derbyshire. They were reunited with MSJ&AR coach No. 114 [subsequently acquired by the AERPS in 2006 for spares and broken up]. 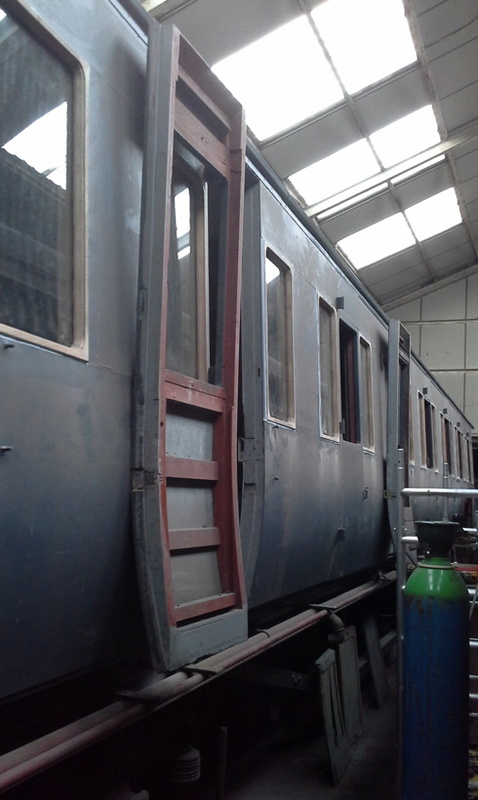 Kept undercover in the large Matthew Kirtley Museum building, the coaches were on display to the public. 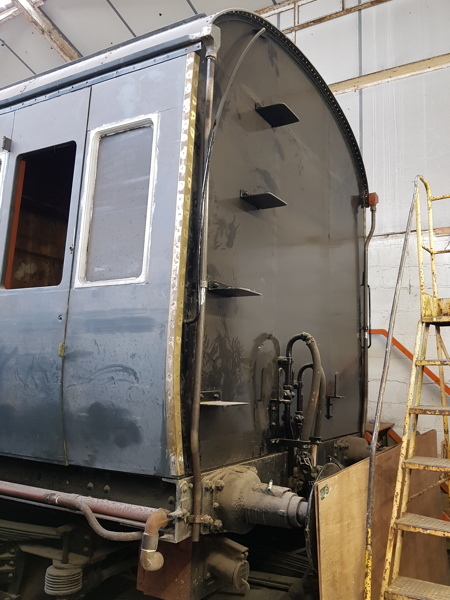 During 1990s major restoration work was carried out on the coaches beginning with the replacement of the steel panelling and roof repairs. 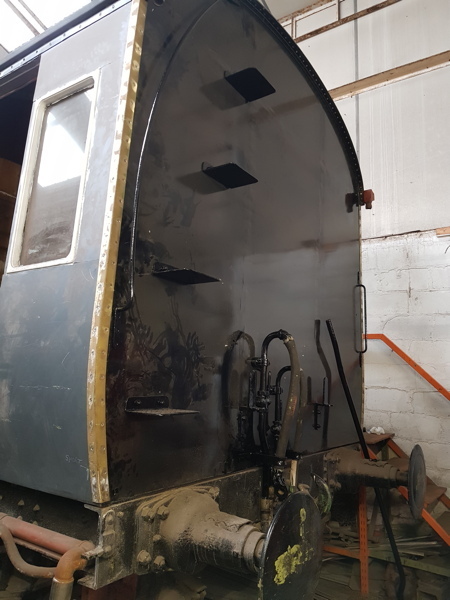 However further work needs to be carried out including refitting and re-upholstery of the compartments, and the fitting of vacuum brakes. The Society made an unsuccessful application to the Heritage Lottery Fund. At a special Committee meeting held on 24th September 2012, it was agreed: ‘That the Society should enter into an agreement with Midland Railway Enterprises PLC for the partial/external restoration of MSJ&A carriage 117 (M29670M)’ and ‘That the Committee agree to work on Phase 1 proceeding in accordance with the contract’. This has been made possible by generous donations by two anonymous members which, added to the funds the Society has managed to set aside for this purpose over many years from sales of donated items and other activities, has provided sufficient funds to make a start. 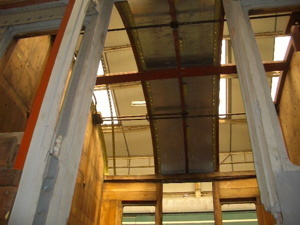 The total cost of Phase 1 was estimated to be just short of £12,000, including materials and VAT. Phase 1 has used the available funds. Phase 2 is estimated to cost in the order of £20,000. The Society has some serious fundraising to undertake. Should any member feel able to donate towards Phase 2 we should be most grateful for their contribution. Cheques should be made payable to the AERPS and sent to our Treasurer, Roger Morris, 38 Wolseley Road, Sale M33 7AU. If you pay tax please augment your donation by 25% by Gift Aid. Your donation could make all the difference. 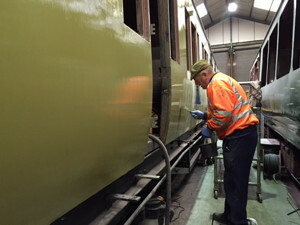 Painting before running board is attached. 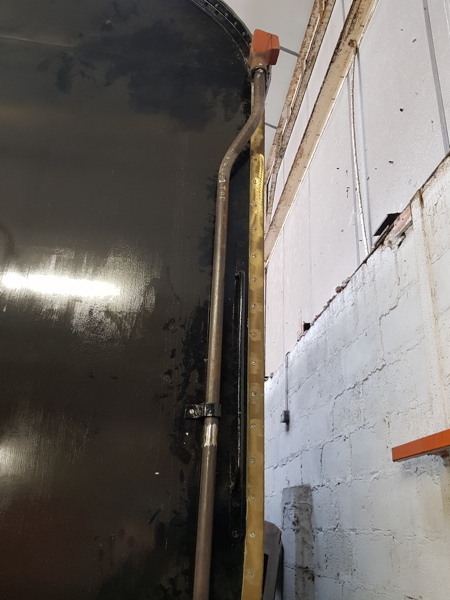 Alan Calladine of MR-B has reported that limited progress has been made with the restoration, as staff at MR-B have had to attend to some urgent jobs over the last two months. 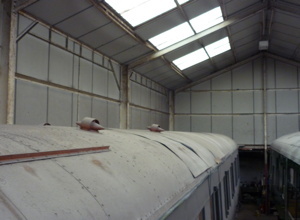 However MR-B intend to restart work on our coach and the completion of the roof panels is the next job. 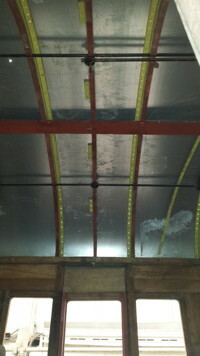 The photograph, taken looking up to the roof, gives an idea of the sheer number of nuts and bolts needed just for one roof panel and multiplied by the total number of roof panels which have to be replaced then you can see this is a time consuming job. 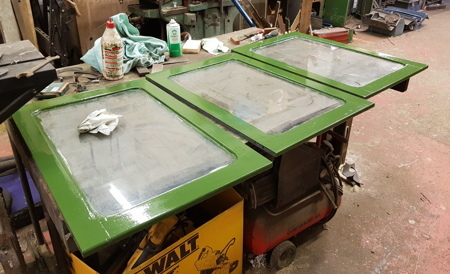 Sealant will be applied between the sheet and the frame first and this will also be applied between each sheet to seal each join but will start to make it look like a coach again. 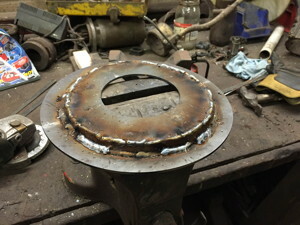 Once this is done work will start to look at other parts of the restoration. 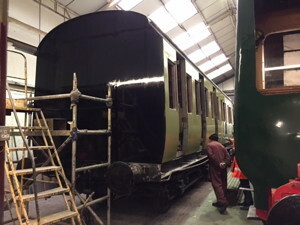 Light reflected from the adjacent DMU, then wet undercoat is most likely cause of greenish tint in centre and right pictures above. 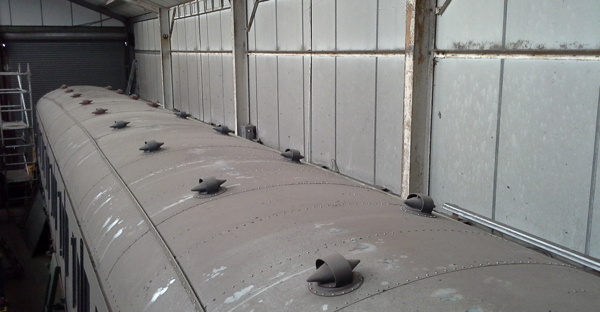 A number of torpedo roof vents which we needed were purchased. 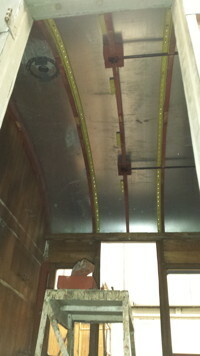 The pattresses were constructed from two welded discs of laser cut metal by MRT staff. 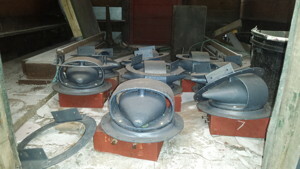 After painting the vent and pattress were bolted together with sealant between them. 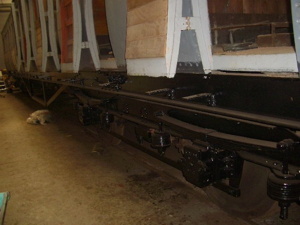 The fittings for the underside of the coach roof were also constructed and painted. 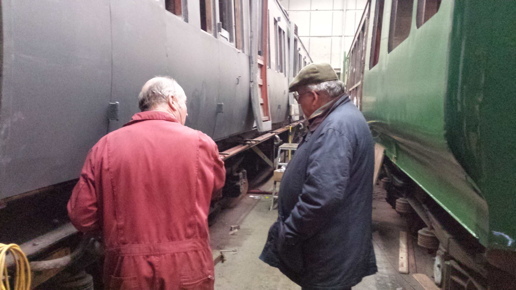 Left: Ed Foden and Nick Dodson discussing work on the coach. Right: Air and vacuum brake pipes. Partially completed roof in left hand picture and finished roof in right hand picture. Views are in opposite directions. 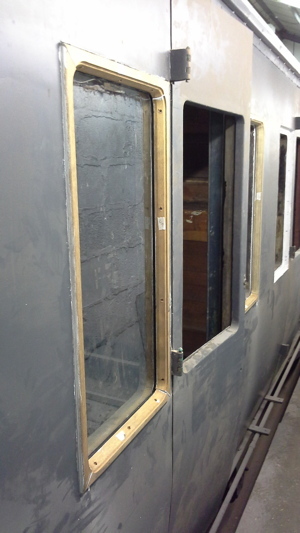 One window has been glazed and four more are in progress. Not surprisingly, no two windows are the same. 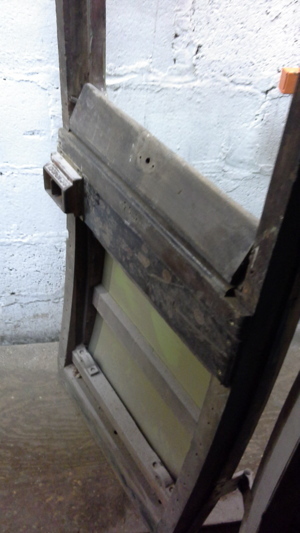 It is necessary to rout out parts of the edge of the rebate so that the glass will fit in the window frames. 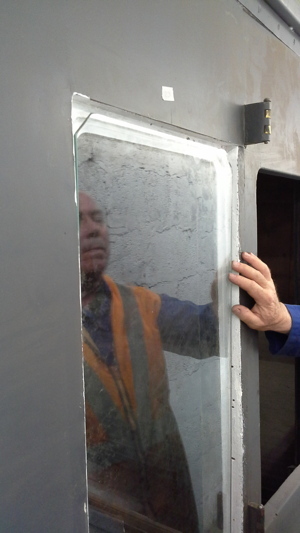 Modern mastic products are being used in place of glaziers putty. Door windows are droplights, they open by dropping into the lower part of the door. 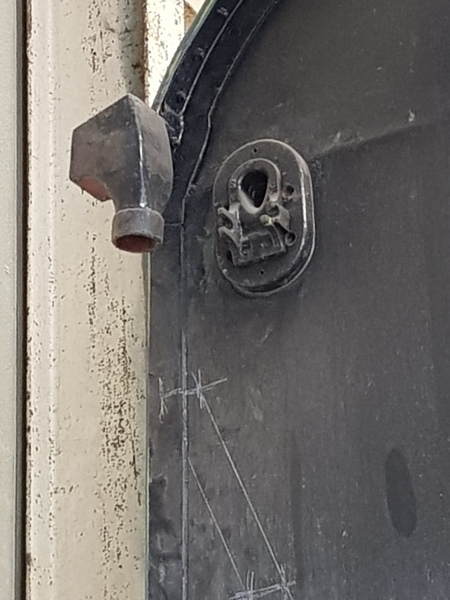 Some of the door window furniture will need repairs. 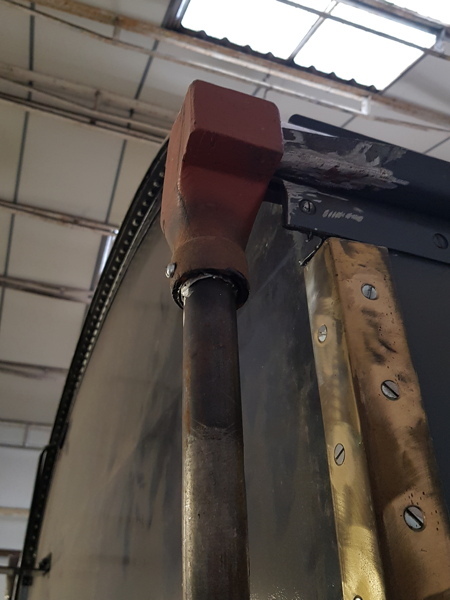 When fully installed, the upper piece is spring loaded to press against the window, it also carries the ‘stud’ onto which the perforated strap holding the window partially open is placed. 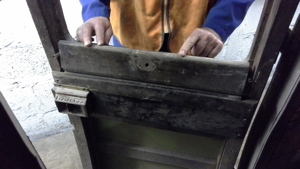 Some wooden parts which form the internal door panels are missing. Replacement parts may be made rather than spending time in a possibly futile search for the originals. 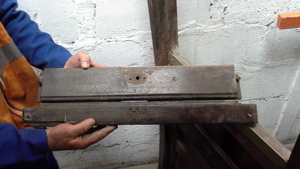 Above:– Two ends of the Coach; right with old explanatory sheets held on by magnets. Left:–– Droplight, door windows, recently painted. Subsequently stored in one of the coach compartments. 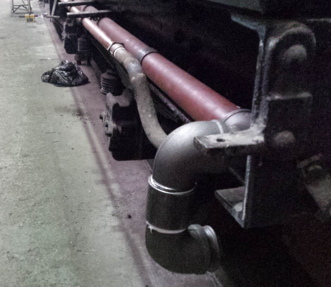 Coach end with rain water down–pipes fitted. 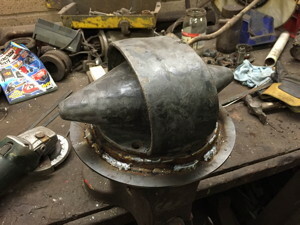 Hopper head fitted and markings for down–pipe.